Wednesday, Thursday, Friday, and Saturday - August 8, 9, 10, and 11. Two bands will perform Wednesday, Thursday, Friday and Three bands will perform Saturday. The Festival is always free and open to the public. Audience participation is one of the most important parts of the festival. The audience is encouraged to appear as if transported from the big band era. The spontaneous dancing in the aisles and the excitement projected for others to see also helps make the festival a success. The Festival, which is provided at no cost to the audience, was designed by the committee to be self-supporting with proceeds from the Covina Concert Band Snack Bar in Covina Park and donations from a variety of entities. The snack bar staff provides food from their reasonably priced menu. The Festival committee is blessed with the help of staff and volunteers from the City of Covina Parks and Recreation Department, and members of “Friends of Covina Concert Band” who donate their time and talent to staff the snack bar and provide publicity, printed programs and stagehand functions. 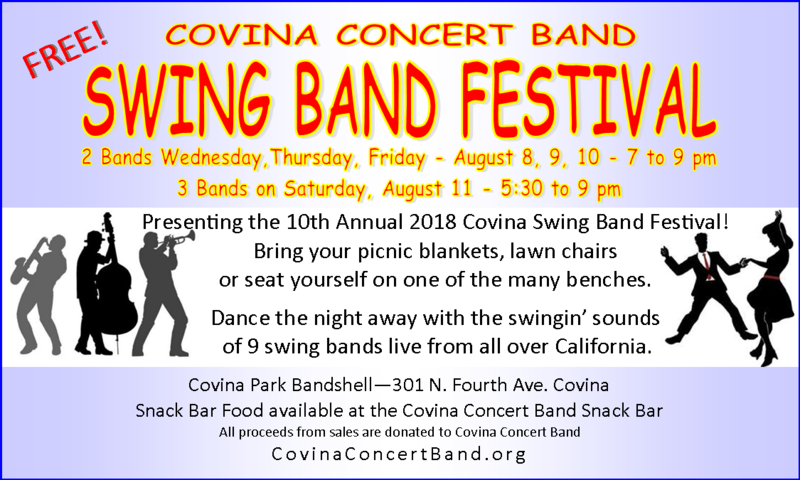 The Covina Swing Band Festival is sponsored by Covina Concert Band, a California not-for-profit corporation.